We have always worked towards providing best quality products in edible oil segment and our varied range of offerings is our way of ensuring the health of India. 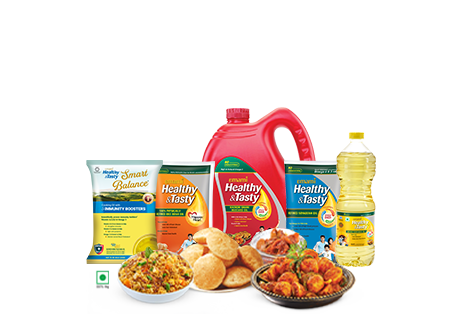 'Emami Healthy & Tasty' was launched in February 2010. Since its inception, 'Emami Healthy & Tasty' cooking oil has been identified as a healthier and tastier alternative to regular cooking mediums. It is specially prepared to suit health conscious consumers who believe in preparing their meals using the best ingredients. Emami Healthy & Tasty edible oil range caters to discerning consumers with a promise that healthy food need not compromise with taste. Emami Healthy & Tasty as a brand has helped break the myth that health and taste cannot go hand-in-hand. We at Emami Healthy and Tasty celebrate family and relationships and have always fulfilled the need of bringing the family together through a sumptuous meal. 'Emami Healthy & Tasty' cooking oil has been developed by adopting a 7 Stage European Refining Technology to create an unique combination of purity and taste along with the retention of natural ingredients. It is enriched with essential Vitamin A, D & E, thus the oil also helps lower the risk of cardiovascular diseases, provides skin nourishment, helps in lowering cholesterol levels, reduces blood pressure and helps improve brain health.